1941-05. TOBRUK. 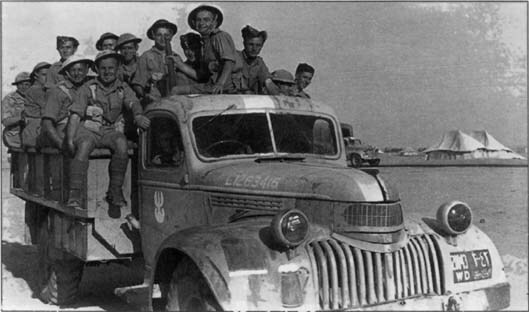 CO-OPERATION AMONG THE FORCES IN TOBRUK IS A FEATURE OF THE PRESENT SITUATION. HERE TOGETHER ARE........ J.M. BROWNLEE (BRITISH ARMY) CHIEF P.O. GOODHEW (NAVY) MECH. BRUCE BOYD (NX10014) OF SINGLETON. THE STAFF OF THE A.S.C. 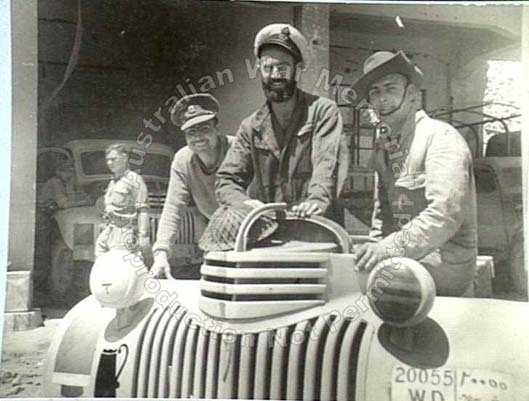 WORKSHOPS IN TOBRUK ARE A MIXTURE OF ENGLISH AND AUSTRALIAN PERSONNEL UNDER THE COMMAND OF CAPT. ROBERTS, (A.I.F.). (NEGATIVE BY F. HURLEY). The beer on the right fender is clearly visible together with the RASC Red/Blue diagonal divided Arm of Service Colour marking. in Andrzej Antoni Kaminski's article on Polish Carpatian Rifle Brigade marking. On the cab doors is headgear-style Polish national marking and Arm of Service Colour is overpainted. The WD number is 20043. The beer was left probably because it was a lot of dreamed about.